Is Work at Home Institute A Scam? Work at Home Institute, or simply known as WAH Institute is another work from home scam. If you are considering signing up for it, read through this review before you proceed any further. Apart from WAH Institute, the scam also goes by the name of WAH EDU program found at wahedu.com. So if you come across a similar work at home opportunity disguised as an education program, stay vigilant. Both WAH Institute and WAH EDU program have identical sales materials and they pitch the same false promises. 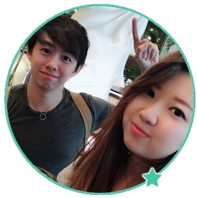 In this review, we will debunk the illusion of earning easy money that these programs try to put into the consumers’ minds. In the homepage, you are required to provide you first name, zip code and email in order to check for availability. However, it’s obvious that this is just a form to collect email so they can pitch other shady “business opportunities” to separate you from your money. See who’s in luck for a job! By the way, I entered this page via a Singapore zip code. The number of available positions is only a fixed number, it will always be 3 no matter what you enter in the zip code form. This alone is the first red flag you should look out for – the program tries to deceive you even before the sales material is presented. The job report is nothing more than a sales pitch featuring the story of a work at home mom who finally escaped her miserable 9 to 5, and generated massive amount of revenue from home. Nothing new here. There are a lot of hypes in the content, boasting how you can use the system and earn a boatload of money without putting in much effort. But the alleged job opportunity essentially boils down to posting links from home. This is a classic link-posting scam. WAH Institute claims that there are companies desperate for people to post their links from home independently, and that they are paying good money for it. WAH Institute says that you only spend 3 to 4 minutes posting a link, and you get $15 for every link you post. WAH Institute argues that it’s more economical for companies to contract people to post links from home, than to expand their operation and hire thousands to do so. It’s just a bunch of lies. Firstly, there is no link-posting job. Companies don’t even hire people to post links for them, let alone paying good money for it. Secondly, the only thing remotely similar to their concept is affiliate marketing. Even so, affiliate marketing is a performance-based industry, meaning you only get paid if you generate sales and results for the companies. There is no job as simple as just posting links and getting money from companies. Why would the companies pay you good money if you are just spamming the internet with their links? No one will buy from these links, and they will not gain any profit from it. There’s just no reason for them to pay for it. To feed you even more BS, WAH Institute prepared a calculator to show you how much money you can make. You can choose the number of links you want to post daily, the average money you will earn for each link (it’s funny that how you can decide how much to earn per link posted), and the number of days you want to work per week. 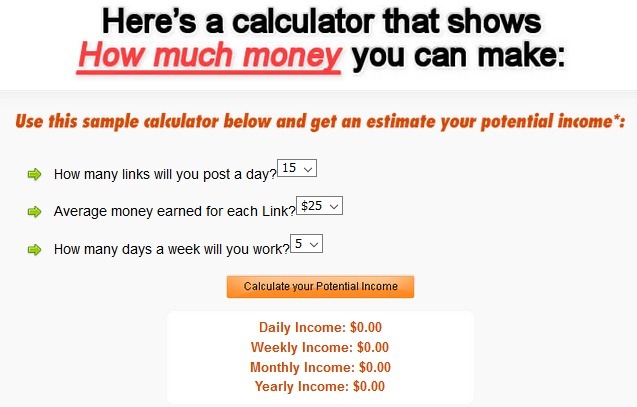 It would’ve done a good job showing the tremendous potential income one can make with the system, but alas, the calculator just won’t compute. WAH Institute is begging for you to purchase their “extremely lucrative business model”, literally. When you scroll to the bottom of the sales page, you are quoted $97 to purchase the program. Now, for anyone who bought into the hype and false claims of WAH Institute, $97 seems like a very small price to pay to generate hundreds of dollars from home every single day. However, it was obvious to me that it’s a scam and I was ready to leave the sales page by this point. So I clicked to close the browser, and I immediately got a $20 off. The new price offered to me was just $77, and I have access to the same program that I would’ve paid with $97 just seconds ago. As if giving a $20 discount is not generous enough, I was give a further $20 discount when I tried to close the browser again. This brings the final price down to only $47, more than 50% discount from the original price. If this doesn’t alert you, I don’t know what will. I was given discount after discount because I didn’t buy into the scam. This is just a tactic used to throw off those who are still hesitating. People tend to get excited when they are given a discount, especially one that slashes the price more than 50%. But the truth is, why would WAH Institute short change themselves by giving so much discount if the program is really legitimate? They simply want to scam your money and give nothing back. Should I Buy WAH Institute? The answer is pretty clear, the final verdict is NO, THIS IS A SCAM! Is My Internet Success Coach a Scam? Is Work at Home University A Scam?